Thomsen's and Waters' respective staffs were bustling about the Claremont's kitchens preparing for the event — whose menu includes poached eggs, morels, asparagus, local fresh cherries, and more. "Right now we're peeling 800 ears of asparagus," Thomsen said. "We're doing grilled garlic toast with Acme bread. We're serving Blue Bottle coffee and squeezing our own juice." How local can you get? Acme is based in Berkeley, Blue Bottle in Oakland. The honey served at the breakfast (tickets to which range from $1,000 to $25,000 a seat) comes from Marshall's Farm in American Canyon. 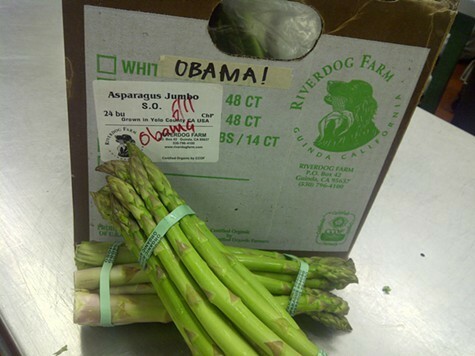 The eggs are from Soul Food Farm in Placerville, the asparagus from Riverdog Farm in Yolo County. "I'm going to be the one poaching the eggs," Thomsen said. How to poach perfectly? "By taking the right amount of time and using great product." On a related note, last Friday, the media ran away with a rumor about the Claremont's new vegetable gardens that I knew from the start was based on a grievous mistake. "Ever since the news broke that Michelle Obama will be talking at a fundraising breakfast June 14th at the Claremont Hotel, the hotel has been spiffing itself up. ... The First Lady's penchant for edible gardening is well-known, as she has heralded the new organic garden at the White House and been the driving force behind an 'eat healthy' campaign aimed particularly at kids. 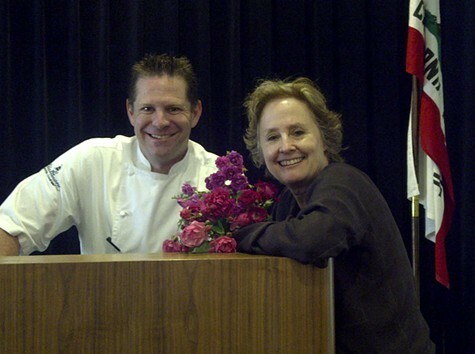 Alice Waters is also preparing locally grown food for the event. "That may explain the appearance of two new large, raised planting beds right near one of the Claremont's entrances. The bed closest to the hotel has tomato plants nestled in wired cages, and the other raised bed is planted with radishes, carrot, beets and parsley. The new vegetable garden can't be missed when getting in or out of a car at that entrance." But I knew that those vegetable gardens were Thomsen's pet project — a year in the making. Thomsen first told me about his plans for the garden last year, when he described his plans to grow organic herbs and produce mere steps from his kitchen and said he would break ground in October. He has been working all winter and spring to get the first beds installed — and was appalled at the blogger's suggestion that the beds were hastily installed just for Mrs. Obama's visit. "I have pictures on my Facebook page of me building the garden months ago," Thomsen told me. "It just annoys me as a culinarian, as someone who looks up to Alice as a mentor and who believes in the same things she believes in, that after I work and work to get okayed for this little plot of land I would be accused" of slapping together a last-minute garden just because First Lady was in town rather than as part of a deeper, long-term mission. That suggestion, he said, "is just inaccurate and inappropriate." A correction later appeared at Berkeleyside, but by that time the inaccuracy had spread around the world. As for those gardens, they've been planted with several types of tomato — including Early Girl, Lemon Boy, Golden Zebra, and Brandywine — along with beets, curly and flat parsley, lemon thyme, mint, and Thumbelina carrots. Some of the mint will do double-duty in skin treatments at the Claremont's spa. The rest will end up being served at the Meritage. Correction, 12:08 p.m.: The Claremont is in Oakland. Our bad.